I want to share a selfie, but pictures are boring. And video is so sluggish. Thankfully there are Gifs! 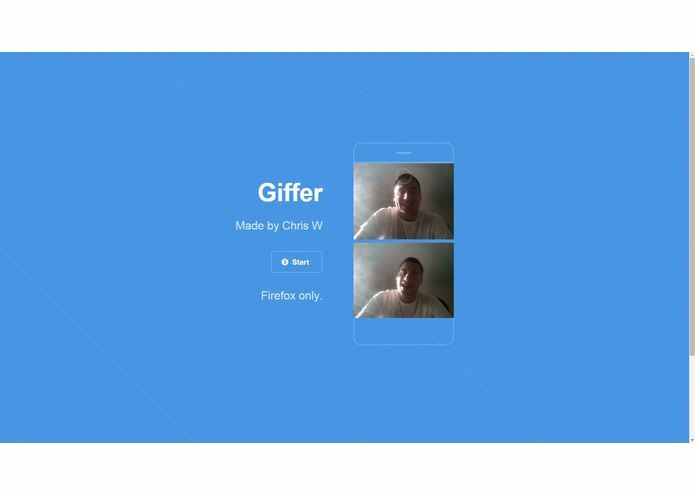 Giffer makes it easy to make a Gif of yourself (Giffy), and easy to share it with friends! I originally wrote this to work with Android. After some technical issues, I decided it'd be best to make it as a website. I made my first website that can turn things into Gifs. The Android camera can be a pain to use. Developing/Prototyping on websites is it a lot easier than mobile apps. Make it available on MOBILE. This will be vital in making it more accessible to people who take selfies the most. Warning: Currently works on Firefox only.